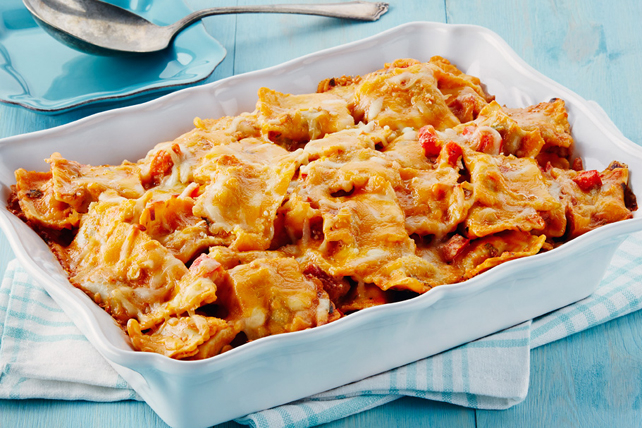 By starting with refrigerated prepared ravioli, this amazing pasta casserole takes just 15 minutes to get to the oven. Layered with a creamy herb-tomato sauce, vegetables and cheese, this pasta bake is packed with flavour. Mix cream cheese product, tomatoes, milk and water until blended. Stir in peppers and onions; spread 1 cup onto bottom of 13x9-inch baking dish sprayed with cooking spray. Cover with layers of 1/3 each of the pasta, remaining cream cheese mixture and shredded cheese; repeat layers twice. Cover. Bake 1 hour, uncovering and sprinkling with Parmesan for the last 5 min. Let stand 10 min. before serving. Bake the filled baking dish on a rimmed baking sheet (placed on the oven rack) to catch any sauce that might bubble over the sides of dish as the casserole bakes. For best results, use a medium-size square ravioli.